Fast days of mud and mayhem fuel a Drake student’s NASCAR dreams. McKenna Haase’s signature No. 55 hot pink and black sprint car takes a turn on Knoxville Raceway’s dirt track. Haase stands in focused concentration between heats at Knoxville Raceway. The Drake honor student is speeding toward her goal of becoming a NASCAR driver. On a typical hot summer Saturday, when other young women might be sunning at a pool, McKenna Haase stands wrapped head-to-toe in a fire-resistant suit and helmet. She climbs into the stark cockpit of a pink-and-black sprint car, a serious 720-horsepower machine that snarls at its pretty-in-pink paint job. A multi-strap harness clutches Haase into the seat. Her vision is limited by the car’s front wing, her wraparound seat and the plastic strip on her helmet visor, a “tear-away” that’s designed to protect her eyes from debris flying off the dirt track at Knoxville Raceway. Mere inches off the ground and inches behind that powerful engine, Haase reads the prayer next to her cockpit instruments and prepares to blast her 1,500-pound machine among a dozen or so others in a race so loud that it shakes the ground, a relentless assault on mud and men—and on this 20-year-old honor student from Drake University. This is Haase’s happy place. Already in the auto racing record books as a teenager, Haase is speeding toward her goal to become a NASCAR driver. Fast is simply her style. At age 11 she took up tae kwon do, and she earned a black belt within a year. Haase is a big fan of her little fans, including Jersey Benson of Mason City, who line up after races to get autographs. “The fans are amazing here,” Haase says. In third grade, she began nagging her parents to let her race sprint cars. They finally gave in when she was a seventh-grader, and she started racing pint-size Outlaw dirt karts and micro-sprints. She founded Team Haase Racing in 2010 when she was 13. 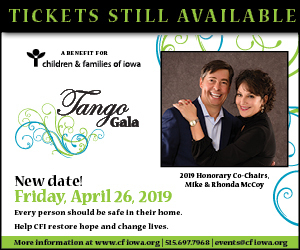 She personally recruits and works to retain the team’s sponsors, including Iowa Select Farms, Casey’s General Stores and Wyckoff Heating and Cooling. As a high school senior, she became the first female sprint car driver to win a feature race in the 114-year history of Knoxville Raceway, the famed “sprint car capital of the world.” The next day, she gave a commencement speech as valedictorian of her Carlisle High School class. Now a finance major with a near-perfect academic record at Drake, Haase maintains the stamina her sport requires by sprinting, swimming, and doing strength work and Krav Maga, the hand-to-hand combat system developed for the Israeli Defense Force. Her workouts include an epic series of pushups—as many as 300 at a time, sometimes with a car tire balanced on her back. Crashes along the way haven’t slowed her down, not even the one that gave her a concussion. Fit, focused and seemingly fearless, Haase is not deterred by the fact that her expensive sport is both demanding and dangerous. At a summer race, Haase checks messages while her crew, led by her dad, Kevin (far right), deals with a crumpled wheel. However the world of auto racing looks in your mind, chances are you don’t have the full picture. It’s popular, with nearly 60 dirt and asphalt racetracks sprinkled across Iowa. It’s a big business, from the cars, trailers, travel and other expenses to the corporate sponsors that pay for them. It’s an economic engine, too. The Knoxville Nationals, for example, draws more than 100 race teams from 30 states, Canada, Australia and New Zealand as well as their 20,000-plus fans to the Central Iowa town (population: 7,241) every August. Business is exactly the way Haase operates Team Haase Racing (THR). Her father, Kevin, a pilot with Iowa Select Farms, takes the lead on her pit crew. Her mother, Kelly, manages her merchandise sales. Older sister Makaila, an associate producer with the media company CMT in Nashville, produces videos, many of which appear on Haase’s website and on YouTube. The job of recruiting and stewarding sponsors is all McKenna’s. This is no small feat. A sprint car chassis and gear cost from $10,000 to $20,000 and its engine ranges from $30,000 to $50,000, with thousands more in fuel and tires. 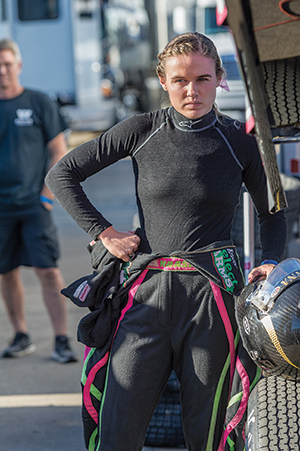 Car and engine parts, marketing materials, safety equipment (Haase’s helmet and neck restraint cost around $1,000 each; her racing suit, more than $2,000), trailer expenses, graphics for the car, fees to enter races, tools and travel expenses add up. Haase may be successful at covering those costs because before racing, she was driven by money—acquiring it, counting it and letting it grow. In an interview on the “Motley Fool” podcast “Rule Breaker Investing,” she described going door-to-door to sell the fruit she picked from her neighbor’s orchard and the $70 she’d make in a weekend selling hand sanitizer, at a quarter per squirt, to port-a-potty users at a local sports complex. She fell in love with Warren Buffett after reading the investment giant’s biography. She had a mock portfolio in middle school and a real one in high school. She now serves as president of the Drake Investment Club. Haase prepares to work out at Drake’s stadium. She keeps her physical motor running by sprinting, swimming and strength training. How Haase did get into racing is similar to how she burns up the racetrack—relentless, focused and fast. During a family vacation in Nashville, Tennessee, when she was in third grade, she had a chance encounter with NASCAR driver Kasey Kahne, who was signing autographs at a mall. Haase then accompanied her grandparents to watch a cousin race sprint cars in Oklahoma. She begged her parents to let her drive 13-horsepower “outlaw” karts at Slideways Karting Center in Knoxville. Haase practiced at the track and watched YouTube videos to hone her driving skills. Meanwhile, her parents, Kevin and Kelly, were thinking—and hoping—their daughter’s interest in the sport would eventually wane. Haase bought an outlaw sprint car in September 2009 to race at English Creek, an outlaw dirt kart track south of Knoxville. Before the following season, she and her team redesigned the car to pink and green. 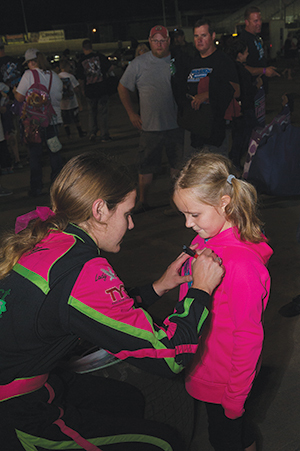 In April 2010, she made her debut as a rookie racer at the Newton Kart Klub—and had a crash that totaled her car, put her in a pediatric emergency room and put her father, who’d cut his hand jumping the fence to come to her, in the adult emergency room. “And that was my mom’s first night of watching the races,” Haase recalls. Before the time trials begin at the Knoxville Nationals, Haase sells her merchandise out of a shiny display trailer loaned by one of her sponsors, TYR Endurance Sport. She operates Team Haase Racing as a business. And there were some hard knocks, literally, along the way. As a rookie driver at Knoxville Raceway, in 2014, she suffered a concussion when she tried to avoid another car that had flipped ahead of her. Two cars behind her flipped onto hers. She took off a month, returned to the track—“a mistake,” she admits—and then sat out for eight months. During that time, she worked with a speech therapist—part of her therapy from the concussion—who needled her to quit the sport. “She said, ‘Do you want to be valedictorian? Or do you want to be a race car driver? You can’t do both,’ ” Haase recalls. She proved that wrong in a big way: On May 16, 2015, she made history as the first woman in the history of Knoxville Raceway to win a sprint car feature event. She stayed up until 4 a.m. to talk with fans, then gave the valedictorian speech the next day at her high school graduation. “Winning that race was cool but also a huge relief because it had taken so long for me to get there,” she says. The historic victory was featured on ESPN and shattered the raceway’s social media channels, snagging more than 550,000 Facebook views. On a Friday night during Knoxville Raceway’s 57th annual Nationals competition this past August, nearly 100 giant semitrailers are parked on the infield of the half-mile dirt track. Conversations are cordial, but the atmosphere is businesslike; everyone has a job to do. Haase traverses the area on a bicycle, her signature pink bow sparkling in the late afternoon sunshine. While her crew preps and checks her car, she rubs scented oil on her palms, raises them to her face and breathes in deeply and calmly. The only female to race weekly at Knoxville, she competes against men who have raced longer than she’s been alive, including many who have raced and won in NASCAR-level competition. In this male-dominated sport, drivers are not categorized by gender, age or, often, experience. And the guys she’s racing with don’t go easy on her. That’s OK—Haase doesn’t go easy on herself, either. “If I didn’t think I could beat the other drivers, I wouldn’t be here,” she says. But she and her mom, Kelly, are quick to praise the “tightknit family” that drivers and their crews represent. Haase contributes to that family in several ways. In 2014 she founded Compass Racing Development to help kids experience racing, from setting up a kart to approaching sponsors. Five kids have participated. Haase is fueled by her fans. She made a surprise appearance at the sixth birthday party of Emma Ryan, who has accompanied her father, Aaron, to the races since she was 2. Emma had requested a Haase-themed event, complete with checkered flag decorations and pizza from THR sponsor Casey’s, but “when McKenna arrived at the party, Emma was star-struck and could hardly speak,” says mom Amber. As always, Haase stays until the last fan gets a handshake, a hug or an autograph on a shirt, hat, photo or checkered flag.